My March ‘19 One Monthly Goal was to finish the quilt top for the Camping Quilt that I will be giving to my brother and sister-in-law who love camping in the comfort of their motor home (me too!). I got it finished last weekend and sent it off to Melissa at Sew Shabby Quilting to quilt it for me using her awesome Camping motif. The cream colored border is actually marshmallows on sticks! I decided on light yellow thread for the quilting. The quilt back has a S’more Love Fat Quarter Panel that is rather cheesy, but I couldn’t resist including it as part of the quilt. I added some extra orange and green owls fabric to break up all the grey grunge fabric, but I think the Camping quilting motif in light yellow thread will show up so well on the grunge fabric. 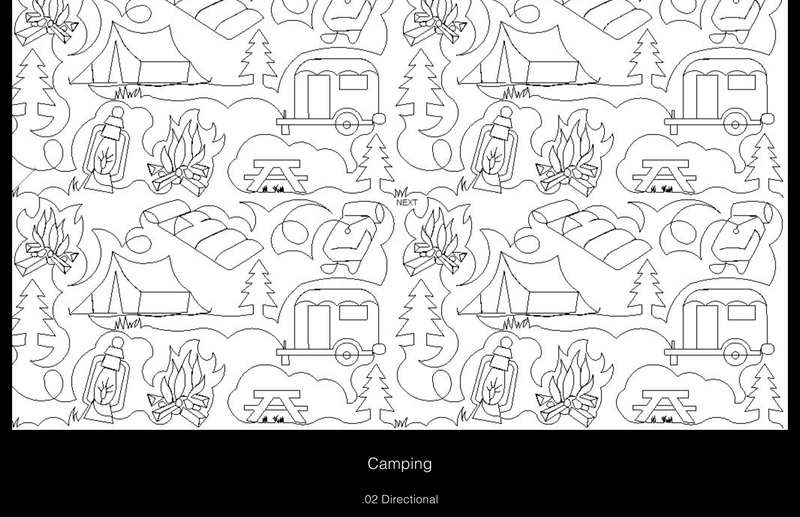 This entry was posted in Uncategorized and tagged Camping Quilt, OMG. Bookmark the permalink. Cute quilt, and that’s a beautiful quilting pattern! Very pretty, perfect for their camper! Wow, what a great quilt and the quilting motif couldn’t be more perfect, could it?! Looks great and what a perfect motif! 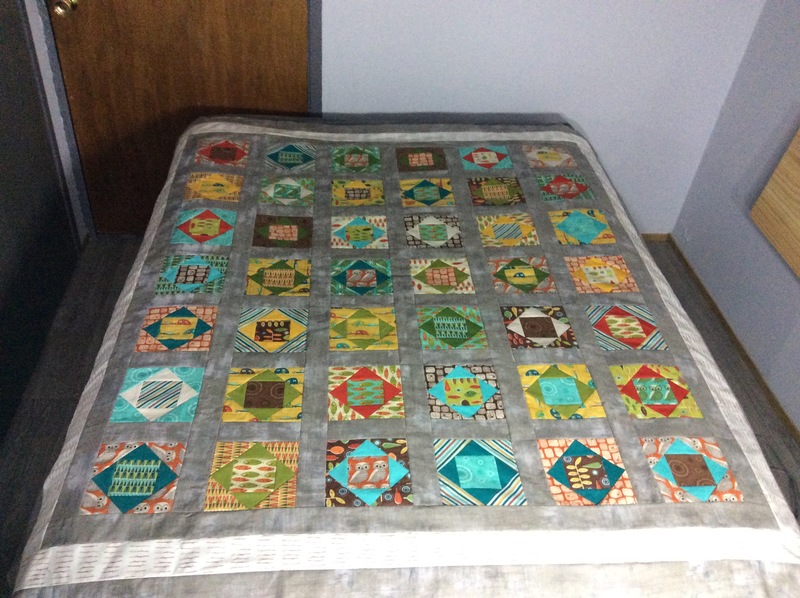 Thanks for linking up with Elm Street Quilts One Monthly Goal and congrats on your finish. Beautiful quilt – and I love that quilting motif! a great finish. 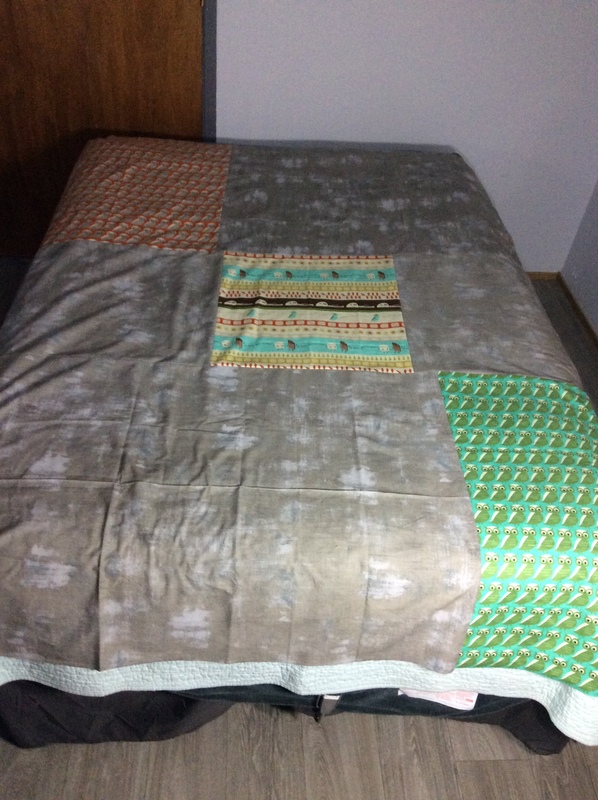 i LOVE economy square quilts, I have been working on one for an eternity, and I especially love the camping panel you used. I am sure they will love it. It turned out wonderfully! Hope you’ll post the yellow threaded quilting!